My flatmate pimped out a 2'6" dime bar last week, so my lady and I decided to go one better with some savoury pimpin' Scotch Egg action. First step was to get our hands on a giant egg. Couldn't find an ostrich egg so we decided to make our own. Research indicated that the relationship between egg length and volume is roughly *10. ie; a standard 5 cm long egg has a volume of 50 cubic centimtres. 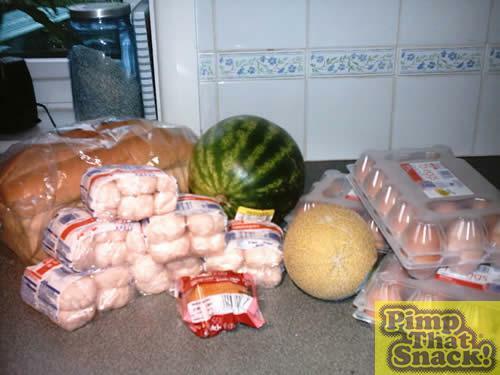 So to make an egg 20 cm long (roughly four standard egg lengths and comparable to the internal dimensions of a watermelon) requires 40 eggs. Spurred on by this flight of mathematical genius, I used the formula 4 pi r squared to find the surface area of a sphere (close enough to an egg shape for our purposes). This revealed that 1250 square cm of sausage would be required. Double this to get an even layer 2cm thick all over the egg and you've got about 2500 cubic cm. A pack of sausages is about 500g, and for our purposes we can assume that sausage meat has the same density as water so 500g=500cm3. So 5 packs of sauasages = 2500cm3 - enough meat to cover the egg. We allowed an extra pimpin pack for contingency. First step was to separate the whites from the yolks, yo. 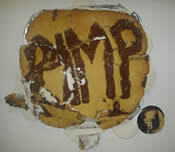 Then, the small melon was hollowed out and stuck back together with masking tape to form a yolk mould. 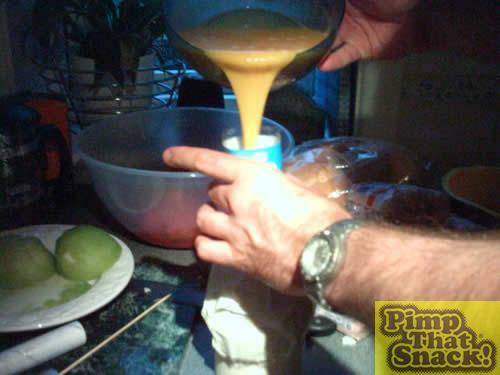 We cut a small hole in the end to enable the yolk to be poured in and lined the melon mould with cling film to prevent any melon flavas from messin' wit' our egg, yo. 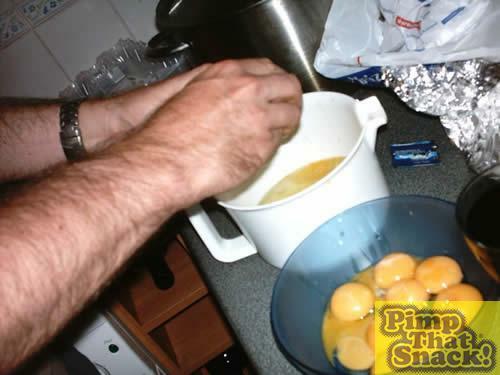 The yolk was poured in and the bung re-inserted. Then the melon yolk ball was immersed in boiling water. Half an hour proved to be not long enough to set that sucka, so we had to finish the job with a five minute session in the microwave. 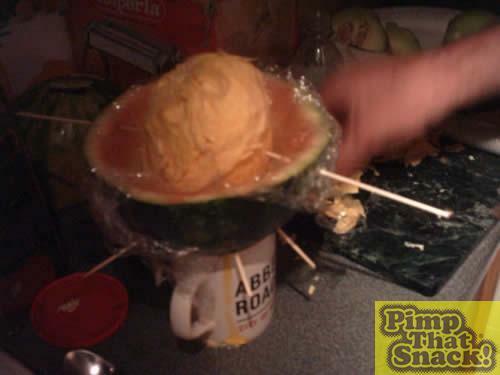 Once cut free from the melon and given a quick tidy up with the scissors, the giant yolk was placed within the watermelon, hollowed out in the same manner as the small melon, and held centrally in place with some skewers to ensure that the white of the egg could surround the ghetto of yolk in the normal way.